Neanderthal Teeth From Spain And Belgium Reveal What They Ate And Who They Kissed : The Salt A new study of the dental plaques of three Neanderthals reveals surprising facts about their lives, including what they ate, the diseases that ailed them and how they self-medicated (and smooched). 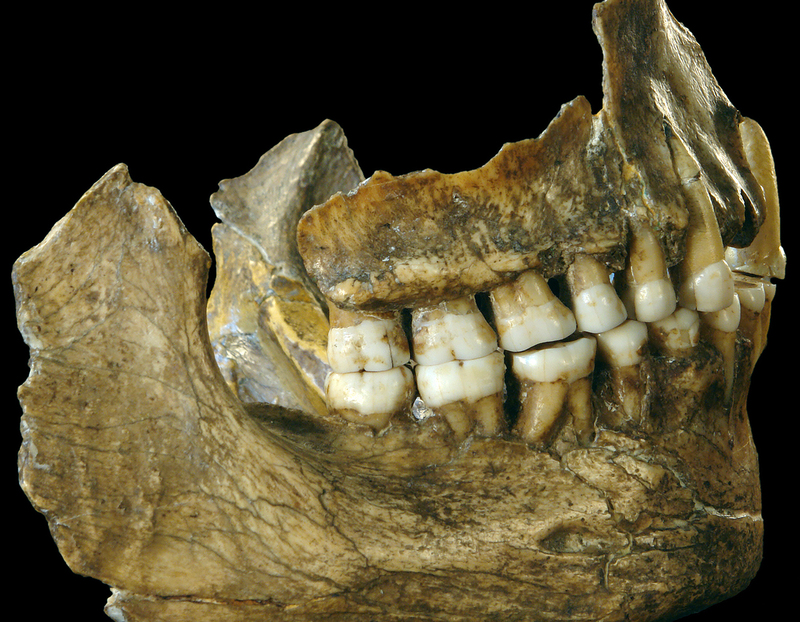 Now, it's no surprise that Neanderthals didn't brush their teeth. Nor did they go to the dentist. 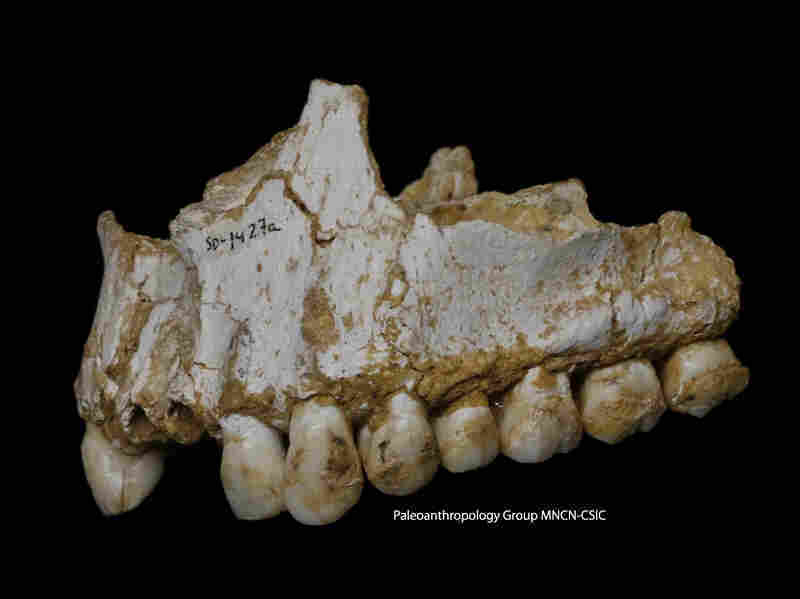 Luckily for researchers, there is an abundance of Neanderthal teeth in the fossil record. "We have complete jaws with teeth, we have upper jaws with skulls with teeth intact, isolated teeth," says Keith Dobney, an archaeologist at the University of Liverpool. As they report in a study published in this week's Nature, the Belgian individual ate mostly meat. "We found evidence of woolly rhino. We found the DNA of wild sheep," says Dobney. The researchers also found evidence of mushrooms, but this was certainly a meat lover. 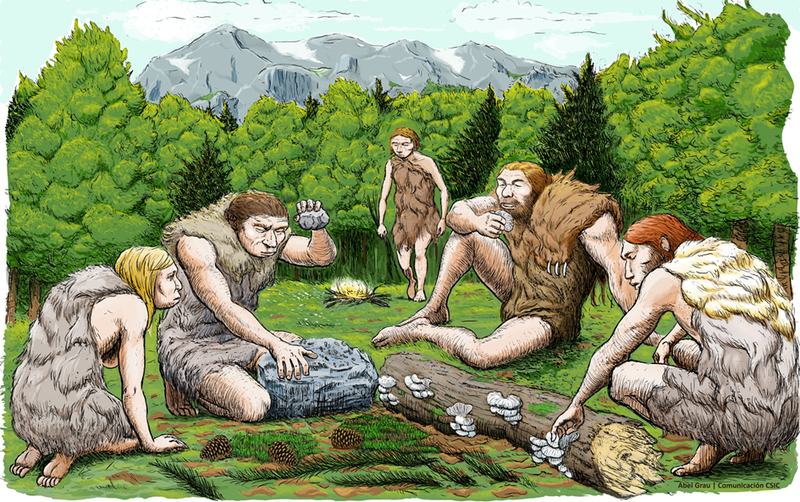 This isn't that surprising to scientists who study Neanderthal diets. After all, the butchered bones of woolly rhinos, mammoths, horses and reindeer had been found in the Spy cave and other sites, suggesting a meat-heavy diet. "Most Neanderthals that had been analyzed [before] were really heavy meat eaters," says Laura Weyrich, at the Australian Center for Ancient DNA at the University of Adelaide, Australia, and the lead author on the new study. She says those previous studies had suggested that "Neanderthals were as carnivorous as polar bears." Northern Europe, including Belgium, had wide open spaces with grasslands and many mammals. "It would have been very grassy, and kind of mountainous," says Weyrich. "You can imagine a big woolly rhino wandering through the grass there." Perhaps tracked by hungry Neanderthals looking for dinner. 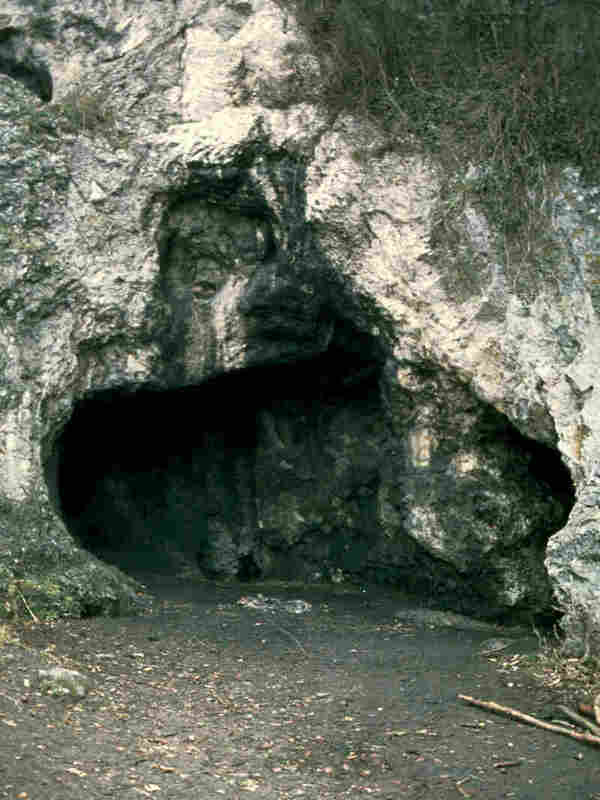 But farther south in Spain, the Neanderthals lived in dense forests. "It's hard to imagine a big woolly rhino trying to wedge themselves between the trees," says Weyrich. And so, she says the Neanderthals there feasted on all kinds of plants and mushrooms. "They're very opportunistic, trying to find anything that's edible in their environment." "Perhaps we shouldn't be surprised that Neanderthals are adapting to local conditions and varying their diets," says Chris Stringer at the Natural History Museum in London. He studies human origins, but wasn't involved in the new study. For example, Neanderthals living on the coast of Gibraltar "were collecting molluscs and baking them," he says. "They were butchering at least one seal. There [was] dolphin material at the site. That may have been stranded dolphin that they scavenged." Stringer says it was the Neanderthals' adaptability that allowed them to thrive for tens of thousands of years across Europe and Asia. "They were very evolved humans," he says. "They lived over a range of very different environments. They lived in different climatic conditions." But Stringer cautions that the new study's findings probably don't reflect everything about the diets of these Neanderthals. "Not everything that you eat has an equal chance of getting incorporated into the calculus," he says. "And not everything has a chance of being preserved long term." One of the individuals in Spain seems to have had a painful tooth abscess and was suffering from a stomach bug. "We saw that he also had Microsporidia, which is a gastrointestinal pathogen," says Weyrich. That means he probably had diarrhea and was throwing up. "He was a sick individual," says Weyrich. "He was a young adolescent male. He was mostly with ... females. So we like to think of him as this sick boy that the females were dragging along with them." But what's more remarkable, she says, is that DNA in his dental plaque suggests he was self-medicating by eating the bark of poplar trees. "And poplar bark contains salicylic acid, one of the natural sources of what we call aspirin," she says. Even more surprising was that they also found evidence of Penicillium in his plaque. That's the mold that makes the antibiotic penicillin. "It's pretty phenomenal that these guys were so in tune with their environment and to know what was going on and how to treat things," says Weyrich. But the surprises didn't end there. Weyrich and her colleagues also identified the DNA of a microbe that causes gum disease in humans today. "We were able to track back that this particular microorganism was actually obtained from humans, likely about 120,000 years ago." Weyrich and her colleagues don't believe the microbe caused disease in Neanderthals, but they think it tells a fascinating story about how the two species — our ancestors and Neanderthals — interacted. Genetics has shown that the two interbred and swapped genes. "A lot of these breeding interactions had been thought to be rough interactions, something that wouldn't be sensual or enjoyable," says Weyrich. But if they were swapping microbes in their mouths, that suggests a different story: "It suggests that there's kissing — or at least food sharing — going on between these two groups. So we really think that those interactions were probably more friendly, and much more intimate, than what anyone ever imagined before." "It's a very exciting paper," says Jean-Jacques Hublin at the Max Planck Institute for Evolutionary Anthropology, who was not involved in the new study. "It opens a new window into the past, a new way to investigate [the] life and behavior of Neanderthals."